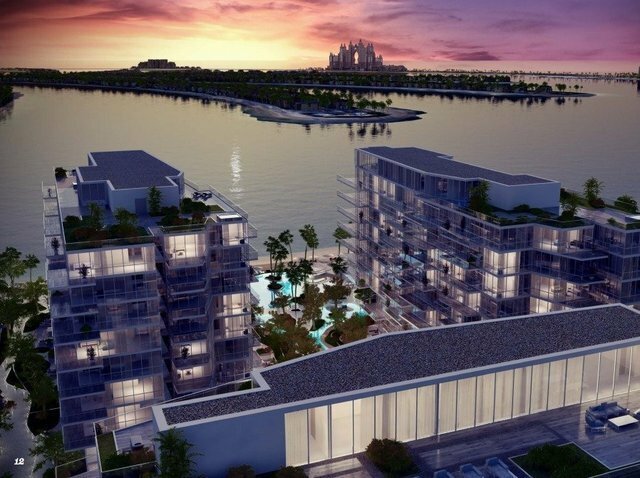 SERENIA promises an unrivaled lifestyle, inviting residents into a world of architectural excellence, contemporary interiors, an array of outdoor facilities and bespoke services. The SERENIA identity is a fusion of natural elements - a vivid reflection of the environment in which it is situated. SERENIA offers you a pure connection to nature and relaxed bliss with its sophisticated architecture, where floor to ceiling glass blur the boundaries between outdoors and indoors, providing panoramic views stretching across The Palm towards the Atlantis, Burj Al Arab, the Dubai Marina skyline and the captivating blue seas of the The Gulf. Tranquil, sun-drenched terraces merge within a dramatic setting of contemporary styled interiors, with no compromise on luxury. SERENIA ensures that your world becomes beachfront living at its finest. A home filled with tranquility, meticulously selected finishes and round-the-clock concierge services that ensure every comfort imaginable. When you enter SERENIA, you will enter Dubai’s Most Exclusive Beachfront Residences. Residences in the East and West wings will enjoy panoramic views across The Palm Jumeirah, the white sandy beaches, landmark hotels like the Atlantis and the magical skyline of Dubai Marina. Residences in the North wing will enjoy panoramic views of the calm blue seas of the The Gulf, the iconic Burj Al Arab, Madinat Jumeirah and Burj Khalifa. SERENIA's simplistic yet contemporary architecture blends extraordinary vistas through cantilevered glass and wrap-around balconies. All residences enjoy floor to ceiling windows, whilst luxurious finishes mirror a beachfront lifestyle with muted tones and contemporary styling. A gated private entrance, a grand drop-off area, dedicated golf carts and private parking shall ensure you experience a warm welcome to SERENIA. Your privacy & security will be taken care of through 24/7 security, CCTVs and controlled access.